Speakal, a company driven by its passion for sound, intelligent technology and innovative designs, is ecstatic to announce the BTS8, an office phone system that doubles as a personal computer. The integrated Windows 7 OS enables users to manage and record your phone calls, answer emails, and even video chat with the on board webcam via Skype. The 5” LCD display can be connected to an external monitor via VGA for enhanced visibility. Additional capabilities include fax receiving, SMS text messaging, media player, contacts management, and a calendar empowering the BTS8 to be the ultimate communications and multimedia powerhouse. You can even browse the web and reach your data remotely for optimal connectivity. “BTS8 completely streamlines business communications and computing for the modern office” said CEO David Solomon. “Users are able to optimize connectivity and empower their phone with the advanced capabilities of Windows 7 while saving up to 90% of the power regularly used with a desktop PC” added Solomon. 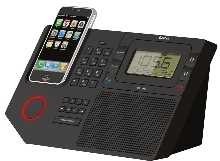 Speakal is also debuting the DS910, a Bluetooth iPhone dock for users to make hands-free calls. It incorporates an easy to read LCD display, alarm clock, FM Radio, and a 3.5mm auxiliary input for other music sources.